Mugsy was trapped and turned in to our shelter by a group of neighbors who were fed up with his continuous fighting in their neighborhood. 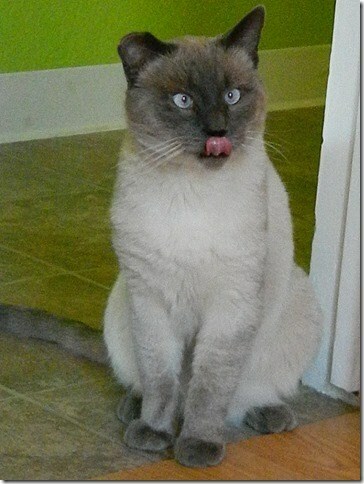 Even though he was a gorgeous blue point Siamese, he had been left, unneutered, to roam and fight. The shelter accepted him as an intact Tom who all thought was feral. Prior to 1/1/2013, he would have been held for 72 hours and euthanized. For years we had been doing this same thing--holding feral cats as required by law, then euthanizing them. It was hard on all concerned and had virtually no effect on the feral population. A-PAL began looking for a humane and effective solution that would ultimately reduce feral cat populations. The current Trap/Neuter/ Return (TNR) program, adopted in 2013, is what they found. Mugsy didn’t know it yet, but the new TNR program would have an unexpected effect on his story. After his 72 hour holding period, Mugsy was taken to the kind staff at Jackson Creek Veterinary Clinic, neutered, given a rabies shot and had his ear clipped to identify him as neutered. Jeff Holman, animal advocate in charge of A-PAL’s Community Cat program, took Mugsy from the Vet so that he could recover from his surgery. He discovered that Mugsy was not only gorgeous but very friendly, so he was taken to the Feed Barn to be put up for adoption, where he went straight to work soliciting a home, rubbing up against the cage to get petted, and greeting all visitors with enthusiasm. John and Tine Kellog from Paradise Doggy Daycare met Mugsy and thought he would fit right in with them. Now, he is the official greeter at Paradise Doggy Daycare. 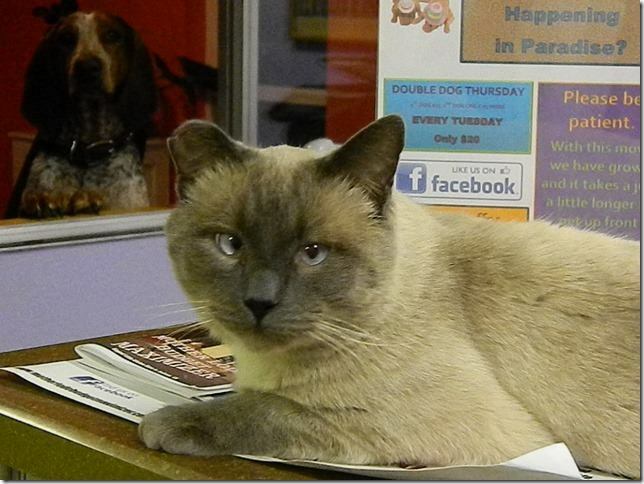 Stop by and see for yourself what a great cat he is!